Bates Manufacturing Company, a textile mill in Lewiston, Maine was started in 1850 and within ten years they were one of the largest textile producer in New England. The business grew and continued to do business for over 150 years. 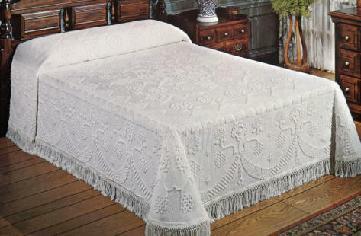 Maine Heritage Weavers was started after Bates closed with a group of former Bates Manufacturing employees who learned from their parents and grandparents, the early craftsmen of the legendary Bates Fabrics' candlewick and matelasse bedspread line, how to weave and finish bedspreads loomed for beauty with the quality and durability of an heirloom. The last generation of Bates manufacturing employees are now the first generation of Maine Heritage Weavers. In this era of the American economy it is almost unheard of for a manufacture to still be doing what made this country strong. The quality of these spreads are unmatched and they are loomed to be heirlooms. My family has used them for as long as I can remember and my bed has one covering it today. 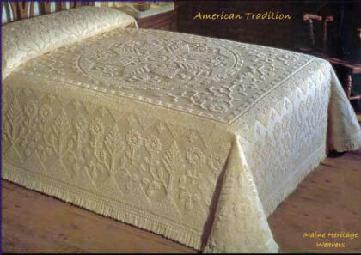 From the Maine Heritage Weavers candlewick collection, the American Tradition is woven in your choice of white or antique. The 100% cotton-terry bedspread is machine washable and will not shrink. The bedspread design features a center medallion star motif with a pine tree and floral vine design on the drop and pillow area. 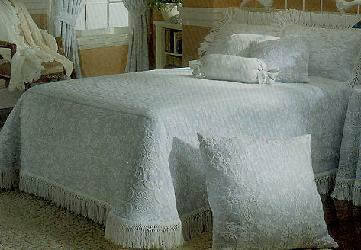 This bedspread is lighter in weight than Martha's Choice which is our other candlewick/chenille design.